A major announcement is expected to be made at the Cando Conference which will be held this fall in Fredericton. Officials from the St. Mary’s First Nation, which is located within the city limits of the New Brunswick capital, are hoping to reveal their plans for a massive project in their community at the conference, held in conjunction with the organization’s annual general meeting. The conference and AGM, which run Oct. 23-26, will be co-hosted by the St. Mary’s First Nation and the Fredericton-based Joint Economic Development Initiative. Allan Polchies Jr., who has worked as a community planner for St. Mary’s for the past eight years, said the project, which in all likelihood will be revealed in October, is expected to employ about 100 people. The St. Mary’s First Nation already has its share of successful business stories. The First Nation operates the St. Mary’s Entertainment Centre, which is the largest bingo facility in Atlantic Canada. The 1,300-seat venue was built 21 years ago. Poker tables and video lottery terminals were added 15 years ago. And now the centre, which is open daily, attracts huge crowds, including bus groups from across New Brunswick, Nova Scotia, Prince Edward Island and even the state of Maine. The First Nation also owns a complex featuring a retail sales operation. Businesses at this facility include a supermarket, gas bar, smoke shop and the Wolastoq Wharf, a fine dining seafood establishment, which has been selected as the top restaurant in Fredericton by TripAdvisor for the past three years. “The key thing about our operations is everything is band owned and operated,” said Polchies Jr. In total, the St. Mary’s First Nation currently employs 450 people through its various businesses in the community, making it one of Fredericton’s largest employers. 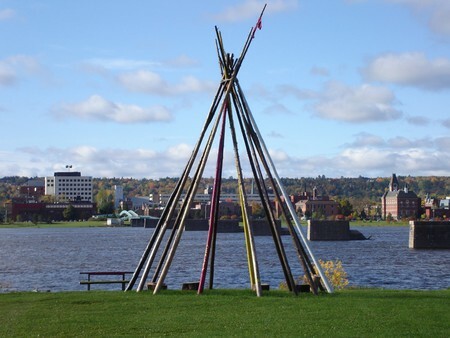 “We like to think as Fredericton as a suburb of St. Mary’s,” said Polchies Jr., adding St. Mary’s is one of two First Nations in Atlantic Canada that is located in an urban location, entirely within a city limits. Polchies added being in an urban environment, however, has also provided some challenges for the First Nation. “We have to compete with the big box stores that are developing around ourselves,” he said. Yet St. Mary’s, which has about 1,850 members, continues to grow and prosper. “We’re also a big supporter for individual entrepreneurs in the community,” said Polchies Jr.
For example, in the past five years 60 houses have been built on the First Nation. Only local workers have been hired to complete these projects. “We reinvest everything into our people because at the end of the day we want people to recycle (their money) back into the community,” he said.